Bed decoration, with petals and blossoms from local gardens, is a longstanding tropical resort tradition practiced with great panache in the Maldives. Kuramathi has innovated on the concept with towel sculptures. 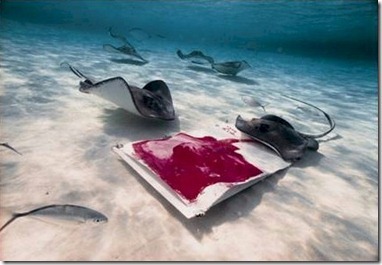 And Anantara Veli provides another twist with coral floor decorations (see photo above). 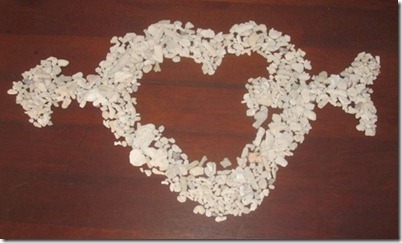 They create a variety of artistic greetings to guests using coral bits from the beach. 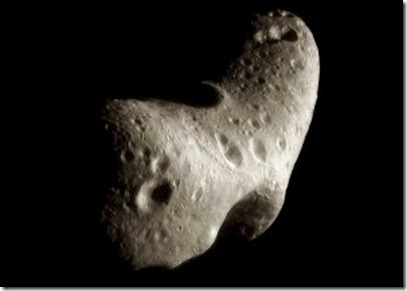 This distinction seemed appropriate to call out today with the passage of another romantic rock flirtingly brushing by the earth more closely than it has in over three decades – Asteroid 433 Eros (‘Eros’ of course the ‘God of Love’). Mind you, that intimate encounter is still 16 million miles away. So today in Anantara Veli you can get romantic signs from above in the heavens or below at your feet from possibly the most romantic rocks in the Maldives. Actually, seeing a baby Zebra Moray Eel, at Kuramathi’s sister resort Kurumba, was the underwater highlight for my wife Lori during our last visit to the Maldives. There were wonderful reef sharks swimming all around us, but all she wanted to look at was this shy little black and white stripped critter ensconced in a crevasse. 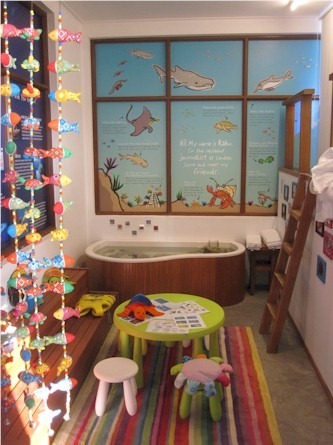 It’s not just the wee turtles and anemone fish that get special nurseries for their development at Four Seasons, but the littlest guest get their very own special area inthe Marine Discovery Centre. 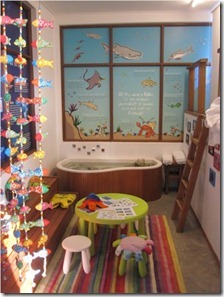 Four Seasons Landaa Giraavaru has put in its trademark attention to detail to a special young kids area of the Discovery Centre with colourful decoration and a hands-on ‘discovery’ tank. It even has it’s own special mascot, ‘Kaku’ (short for ‘kauni’ which is ‘crab’ in Dhivehi). Kaku has his own email address, postal address (“3rd Hole on Landaa’s Palm Tree Road”), and Facebook page where he posts his ‘Reef News’ articles. So kids can keep engaged and keep learning even after their family stay. 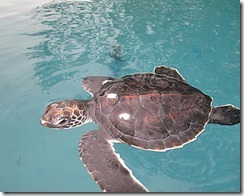 A real ‘Born Free’ story in the Maldives are the turtle nurseries that a few resorts support. Our family delighted at the nursery tank that Filtheyo had and visiting it fostered our daughter Isley’s love of turtles and her adoption of them as her favourite creature to this day. 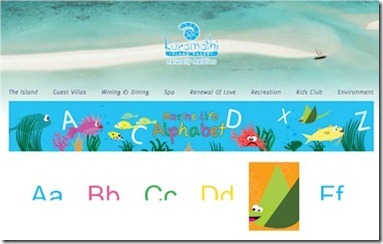 But, Four Seasons Kuda Huraa have taken a page from their sister resort of Landaa Giraavaru to creative a comprehensive turtle conversation programme around their newly launched nursery and discovery center. Not ‘Free Diving’ as in ‘Free Beer’. ‘Free’ as in free of any artificial aids. A bit of a crazy and often quite dangerous sport. Its practice has been reigned in over recent years after some fatalities. But now the sport is more restrained and even more meticulous about safe practices and limits. 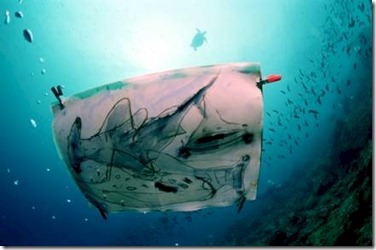 I’ve regularly try just taking a plunge down a bit deeper when I am snorkelling in order to see something a bit close. Pretty much as soon as my body is inverted, my eyes and sinuses start to ache feeling the extra water pressure just a couple metres down. It always fascinated me when the locals and dive masters could descend several metres at will. How Umberto plummets to the bottom of the ocean is beyond me. 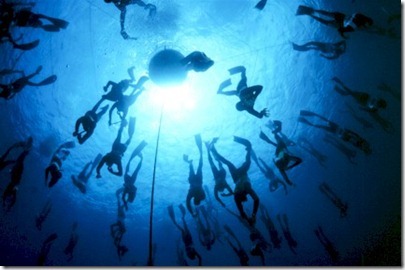 Sakis also features some cool videos on the event and free diving in his post on the week. Scots at heart around the world will be raising a wee dram in honour of ‘Rabbie Burrrns’ tonight. 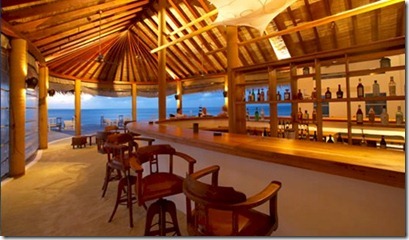 And if you are in the Maldives, then the best place for a Burns Supper is Island Hideaway with its Meeru Bar which boasts “the largest malt whiskey selection in the Indian Ocean.” Indeed, they serve up 60 different types of whiskey including Macallan 25 Year and Handmade 1976 Vintage Bourbon. The bar manager tells me that Macallan and Glen Moray are the most popular. If you are having difficulty deciding on which malt to fill your glass with such a baffling array of options, then I suggest the following handy guide – Single Malt Whiskey Flavour Map. To the health of the women! 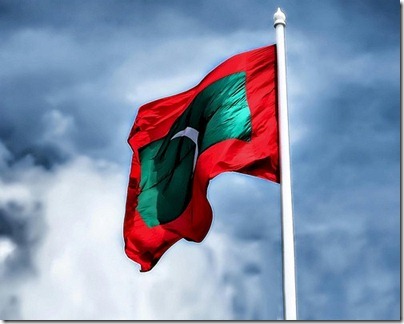 A celebration of Maldivian independence from Portuguese rule in 1558. Our recommendation for the resort to celebrate all things Maldivian is Park Hyatt Hadahaa. For starters, they add a bit of an authentic twist to their local island excursion. 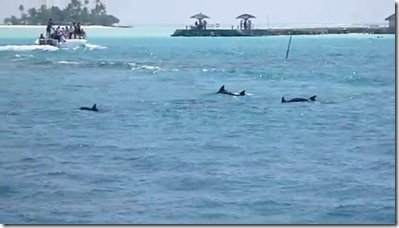 Most resorts offer day trips to local island which provide a glimpse of daily life through a cursory tour. Perhaps the chance to pick up a more native piece of handicraft. Hadahaa has put a bit more effort into introducing its guests to the Maldivian culture with it ‘Journey to the Maldivian Passions’ with 3 distinct experiences on offer.. 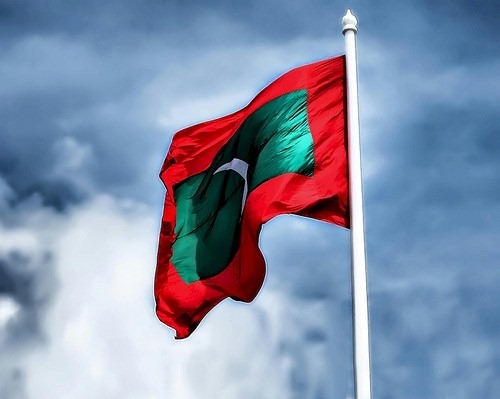 Identity, Faith and Celebration – Take a journey to an outlying island and explore the Maldives first hand. Your personal guide will accompany you to Kondey or Dhandhoo on our high-powered speedboat and then provide an educational tour on the intricacies of local culture, religion and festivities. Artisans – We visit the source of this unique skill and meet the local artisans in their workshops to glimpse a moment of their life. Incorporating traditional values and skills of the people of the islands, handicrafts of Maldives which combine skilled craftsmanship with artistic techniques. Food and Family – Meet a local host and share a moment in the daily life of a fisherman’s wife and her family devotions, and see them living in coral houses furnished with handicrafts. Discover the simple existence of Maldivians in harmony with nature, learning the women’s daily household chores, how they prepare the unique main meals from scarce wood in the smoky traditional kitchens. Each take about 3 hours, cost about $200 per person and have a minimum of 2 and maximum of 4 people. Reef-frames are the only things with better labels as I have this week updated the ‘Tags’ used on Maldives Complete. Of course, you can always use Google or the Search facility on the blog to search for text like ‘snorkelling’ or ‘surfing’. But, text search will indiscriminately bring up any mention whatsoever of that word. 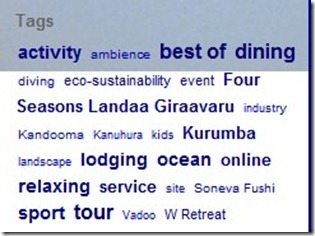 Tags are used by sites to indicate important topics in the post or page. If you select one of the ‘Tags’ at the bottom of the posts (or in the ‘tag cloud’ – see above – which highlight the most prevalent tags scaled to proportion of their use), then it will bring you all the posts that are focused on that subject. 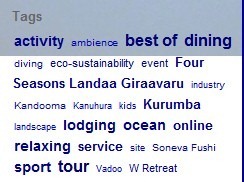 For a long time, I have had a collection of tags corresponding to the various ‘Best of the Maldives’ categories (eg. Sport, Activity, Service, Online). And over time, those have morphed a bit as certain sub-categories grew big enough to merit their own break out (eg. Surfing, Shopping). For starters this week, I have added another breakout to ‘Activity’ which is ‘Boating’. 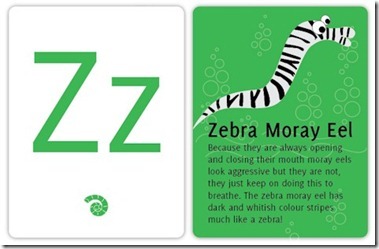 Fun – whimsical stuff that just brings a smile to my face.